Hot Springs, NC, a resort destination for almost 200 years, has long been renowned for its healing hot mineral springs, scenic mountain setting, and abundance of natural resources. 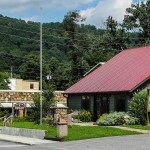 Recently voted the Best Small Mountain Town from Georgia to West Virginia by readers of Blue Ridge Outdoors Magazine, you will find we have a welcoming small town feeling. Just 40 minutes north of Asheville, we are located at the junction of the Appalachian Trail and the French Broad River in a valley surrounded by the Blue Ridge Mountains and the Pisgah National Forest. Hot Springs is the only town in North Carolina where the Appalachian Trail runs directly down the main street. This is a small town with a huge heart, and that is what truly endears it to the people who pass through or come to visit the springs. Everyone knows everyone, and everyone knows when a hiker, or a reporter, comes through town. Besides all the recreation opportunities, which are numerous, this welcoming atmosphere is what really defines Hot Springs. Visit us soon!